Barcelona skipper Xavi believes his team "deserve" to win the Spanish title following a testing season for the Catalan club off the pitch. Barca host leaders Atletico Madrid on Saturday needing victory to pip their opponents to the title. Former coach Tito Vilanova died last month, while the club faced tax fraud charges over Neymar's signing, plus a Fifa transfer ban, earlier this year. "We have got a historic opportunity and now we cannot mess it up," said Xavi. "The league is over nine months and we have worked hard to get here. It has been a difficult year off the field but we deserve to win the league title." Atletico lead La Liga by three points but second-placed Barca will retain their title with a home win at the Nou Camp because of their superior head-to-head record in La Liga. Barcelona's challenge looked to be over after a 2-2 draw against lowly Getafe on 3 May, before Atletico lost at Levante the following day to reignite their hopes. "Everything is in our favour now. 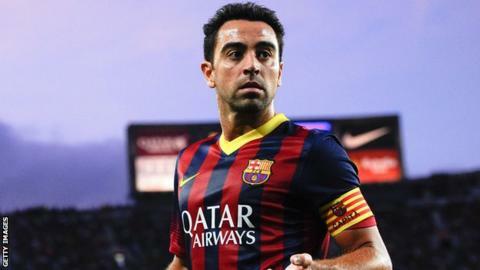 We're at home and the fans have to get behind us from the first whistle to the last," added 34-year-old midfielder Xavi. "We have got all the players, we have got the experience of what we have done over the years, we are hungry to win titles." The reverse La Liga fixture at Atletico's Vicente Calderon stadium ended goalless, while the pair also drew both legs of the Spanish Super Cup which Barcelona clinched on the away goals rule. However, Atletico had the upper hand in Europe this season, beating Barca 2-1 in their two-legged Champions League quarter-final. Barcelona did not manage to score the opening goal in any of these five meetings and Xavi says an early home goal could be key in the title decider. "We need to score first then Atletico might leave more space behind. We have to create more chances than we have previously, but it is difficult against them because they are the best defensive side in Europe," said the veteran Spain international. "We will try every way we can to score - shots outside of the box, get out wide - every type of way you can score in football."